The court ruled that for people renting out their rooms who have not obtained a licence to run a hotel business under the 2004 Hotel Act, only rentals of 30 days or more would be legal. 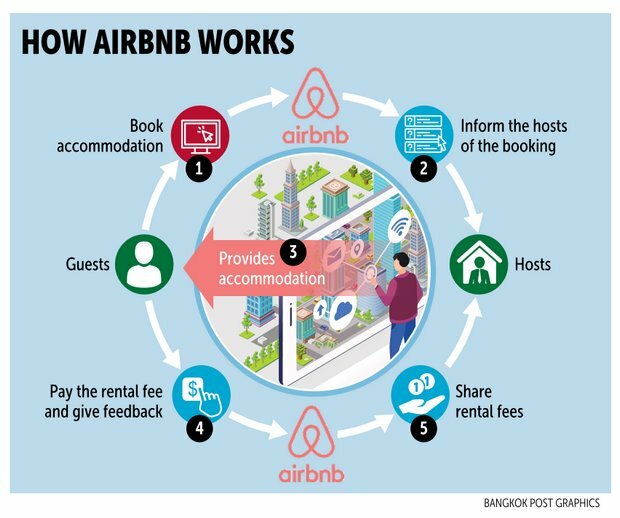 The parties affected by the ruling include owners of condos who rent out their rooms via the Airbnb app on a daily and weekly basis to both Thai and foreign customers. The owners of the condo rooms fear that as a result of the ruling, authorities will strictly enforce the law and it would no longer allow them to operate their business via Airbnb, leaving customers no chance of finding accommodation through the app. According to media reports, the Wan Vayla Condo in Khao Tao has received a letter from the local authorities outlining the court’s decision in two of three cases in which condos were rented out for less than a month. In one case, the court ruled that a fine of B5,000 must be paid plus B500 for each day of the 20-day stay, a total of B15,000. In the second case, the court ruled that a B5,000 baht fine must be paid with a further fine of B100 for a staggered 81-day period. The total amount of the fine is B13,100. The third case is pending. Local officials looked into the matter in December and took the case to court. The first case was ruled upon on Jan 5 and the second case on Jan 16. The rulings in both cases were only recently made public. The rulings, if enforced nationwide, could be the beginning of the end for companies like Airbnb in Thailand who have consistently said that their business is legal. Airbnb actively promotes its business in Thailand and the consequences from the ruling could be immense for the company, renters and consumers alike. The Wan Vayla Condo sits on 20 rai of land in the Khao Tao area. Meanwhile, the Thai Hotels Association (THA) has asked the government to revoke non-registered hotels including Airbnb apartments and condominiums. They say these operators are causing problems for the nation’s tourism industry. Surapong Techaruvichit, an adviser to the THA, said the association wants the government to invoke Section 44 to deal with the problem. “We believe the number of non-registered properties will decrease if the government exercises Section 44,” he said. According to him, more than half of the hotels in the market are non-registered hotels, otherwise known as illegal hotels. Illegal hotels include serviced apartments, guest houses, condominiums, and other private properties available for rent for tourists. These properties are not registered as hotels under the Department of Local Administration that approves and issues hotel licences. He said that the THA considers Airbnb a new threat to the hotel and tourism industry. Warangsuk Wittayapanyanond, a flight attendant based in Dubai, said she thinks if Airbnb is banned in Thailand, it will limit the choice for tourists. She said since many people prefer Airbnb to booking rooms from hotels, there should be a way to allow Airbnb to operate legally and to accommodate customers who prefer using the site. “I think [Airbnb] affects hotels. It’s exactly the same as when Uber came out. There was a huge protest against Uber by the taxi unions. So, the government banning Airbnb in Thailand must have something to do with the hotel industry. They might have to actually lower the prices and give customers more choices. In some way, the creation of Airbnb lowers hotel prices and it expands customer choices. Airbnb is more independent and provides a different experience,” Mr Stankov said. Airbnb representatives are rumoured to be meeting Thai government officials Saturday in order to settle the issue.